Standing computer desks have been all the rage, but finding one that fits your personal work style takes a lot of research and time that you don’t always have time for at home or at the office. We’ve done the research and checked all the reviews to bring you the top affordable computer desks that allow you to stand while you work. If you’re ready to find the perfect standing desk, you’ve come to the right place! There are a few things to consider before you buy a standing computer desk. You want a desk that’s sturdy and adjustable to fit your stature. The size of the desk also matters as not all home offices or cubicles offer enough space for a desk that moves around frequently. Here are the top six features you should look for before buying your standing desk. Material: We all love a sturdy and durable desk. It gives us a space to put all of our knick knacks and holds all of our papers, computer, and keyboard. If you’re looking for a desk that matches your current decor, material is also important. Size: Finding an adjustable computer desk that fits your space is the most important aspect. You’ll want to find a desk that fits comfortably in your office and in other areas if you plan to move your desk throughout your space, too. Adjustable Height: Not every person needs the same height adjustment. Look for a height adjustment that fits your stature to ensure you won’t be bending down throughout the day while you work. If you don’t get the right height, the benefits of your standing desk will go to waste! Assembly Required: Putting your own desk together can be a difficult task, but many give well thought out instructions for you to use if assembly is required. If you’re looking for an easy setup or a desk that comes pre-assembled, be sure you look for that before you buy. Mobile: If you plan on taking your desk from one area to another, you should look for a desk that has wheels or has the capability of being mobile. Not all desks offer mobility so be sure you find a desk that can move from place to place. Warranty: Warranties help you keep your desk investment safe. Especially for an electric standing desk, you’ll want to have those electronic parts and pieces replaced if something goes wrong upon arrival. Double check for a warranty before purchasing your desk to avoid letting your new investment fly out the window! So now that you know what to look for, it’s time we show you our top 10 standing desks! Our top pick and budget pick are our two favorite choices, but you’ll find a few of our other choices on the list below, too. If you’re ready to get work, here’s what we found. 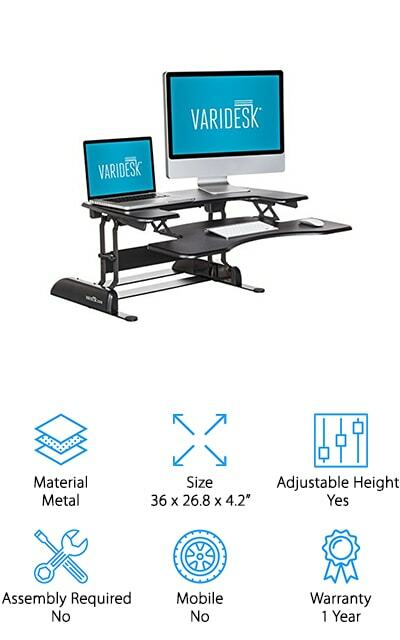 The VARIDESK Pro Plus 36 Desk is our top pick as it gives you tons of options for sitting and standing while you work. 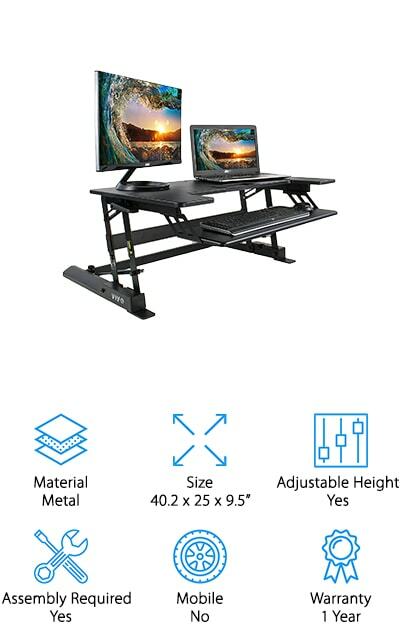 Made from a black-coated metal, you’ll find that this desk is sturdy, but gives you just enough spring to move your computer up and down. This particular desk is two-tiered with separate desk areas. The top desk area has enough room for two desktops while the lower desk area has room for a keyboard and mouse. The desk itself holds up to 35 pounds, so feel free to put your knick knacks and desktops on it. No assembly is required which makes your life much easier. If you find there’s a part or piece missing once it arrives, you’ll be able to get replacements for up to 1 year with the manufacturer’s warranty. 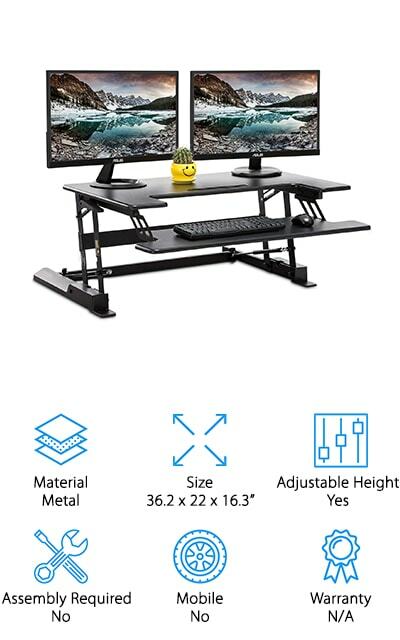 We love this desk as it gives you everything you need in a standing desk that you would find in your traditional desk and holds up to 35 pounds worth of paperweights, computers, and accessories! We chose the Techni Mobili Workstation Desk as our budget pick because it has everything you need out of a standing desk. From wheels to shelving space, you can find everything you need to get your work done. This desk has four separate shelves giving you the perfect amount of space for your computer, papers, and keyboard. The bottom shelf can be used for storage or used as a footrest. On the side, you’ll find a separate rack for CDs or papers. 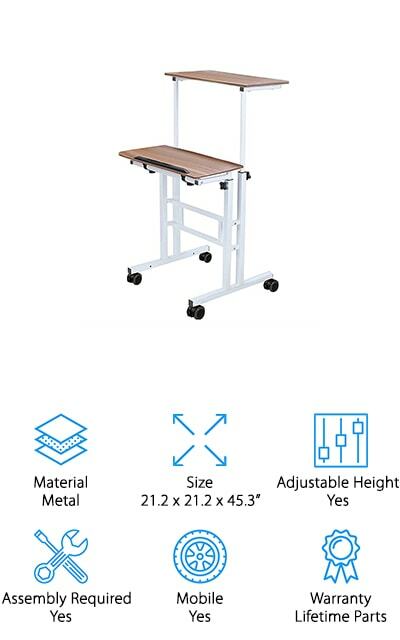 With wheels on the bottom, you’ll find that this ergonomic standing desk can move just about anywhere and is easy to push around. You’ll have to set up the desk on your own, but everything you need is shipped in one box and comes with a 5 year limited warranty. The Techni Mobili Workstation Desk is a great desk for those who need extra storage space and a mobile standing desk, all in one! 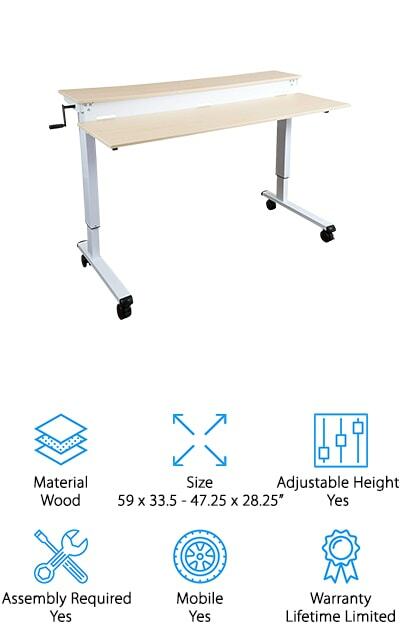 Next on our list is the VIVO Adjustable Standing Desk. This desk is more of a rising standing desk that can rise up an additional 16 inches once placed on your current desk. The top desk area is 36 inches by 22 inches, just big enough for two monitors. You also have a shelf specifically to store your keyboard and mouse, too. Both shelves hold up to 37.5 pounds for any setup you choose to put on your desk. There are also tie downs to manage your computer cables under the desk surfaces. The height is adjustable starting at 6 inches above your current desk with 8 height adjustments. To adjust it any higher, you’ll need to manually adjust the height through the dials underneath the desk. You can assemble your desk simply once it arrives and if anything is missing or malfunctioning, you have up to 1 year to return it. 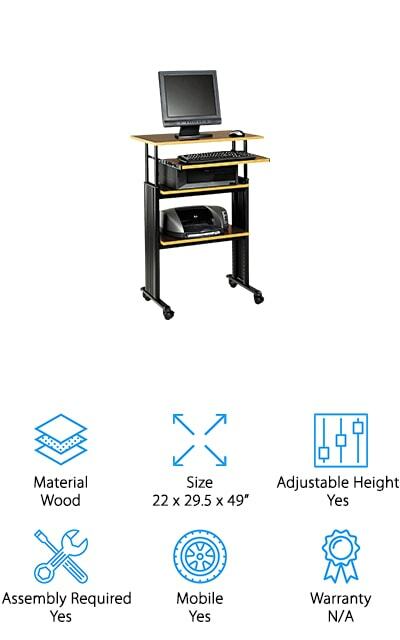 If you’re looking for a great way to add more storage space to your current desk, the VIVO Adjustable Standing Desk is a great option! The Stand Up Desk Store Computer Desk gives you the classic version of a wooden desk in a new age standing desk! With two separate desk areas, you have enough room to store all of the essentials you need for work. This desk is not a riser desk. If you’re looking for a true standing desk that you can push around the office, then this one is for you. Made out of both metal and wood, you get the benefits of a structurally sound desk and a desk that looks good, too. With its ergonomic design, you’ll find that this desk encourages movement, ideas, and calorie burning. You’ll be able to work without breaking your back from wherever you want. If you decide to move your desk from one place to the other, you can unlock and lock the wheels to give you stability no matter where you are. 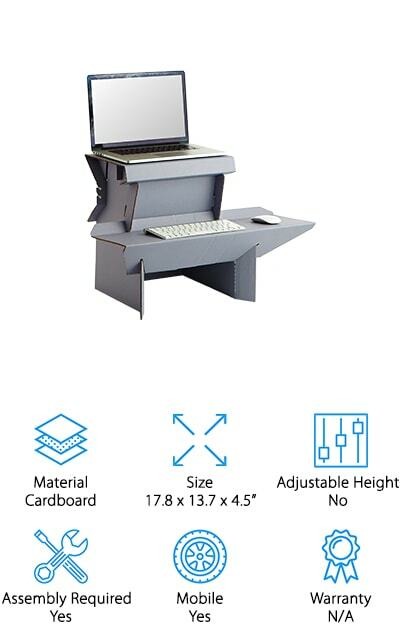 The Stand Up Desk Store Computer Desk gives you everything you wanted from your traditional desk in an adjustable computer desk! If you’re looking for a standing desk that gets the attention of all your coworkers, try the Ergodriven Spark Standing Desk! This desk is made out of cardboard but holds up to 100 pounds in weight. There is no adjusting the size once it has arrived at your doorstep, so be sure to check the sizes to ensure the model you get is comfortable for your size. Since this setup is made out of cardboard, it’s a lightweight and easy to move standing desk from one desk area to the next. Each size desk comes with a laptop area and a keyboard and mouse shelf. Even though this particular desk holds a ton of weight, you’ll be happy to know that it’s priced reasonably as there is no warranty included. If you’re unsure about trying out a standing desk the Ergodriven Spark Standing Desk is a great value desk for any space in your home or office! For the minimalists out there, the SDADI Stand Up Desk will fit right into your style. Made from metal and wood, you’ll find that this desk fits into any space perfectly as it has only the essentials. Two shelves, one for your computer’s main desk area and another for your keyboard and mouse, you’ll have enough space to have everything you use for work right at your fingertips. The height of this desk can be adjusted from 27.5 inches to 45.3 inches. Just turn the dials around to set it to your preferred height. If something goes wrong, you have up to 14 days to return the desk but you’ll always have a lifetime warranty on individual parts that experience wear and tear over the life of using your desk. The SDADI Stand Up Desk is a great affordable option if you want to go from sitting to standing anywhere in your home office. The Techni Mobili Laptop Cart is great for those who work solely from their laptop. This desk is a unique shape and is made out of both wood and metal. Although the bottom part of the desk is not adjustable, the desktop shelf can be adjusted from 27 inches high to 43 inches! Although this standing desk is made for the simple worker, there are a few areas of storage located directly beneath the desktop area. You’ll find access to adjust the height of the desktop beneath the desk. The desktop itself holds up to 20 pounds of gear, but the storage areas are big enough to hold up to 22 pounds each. The shape of the desk is a great for those who only have a few feet of space to store it. 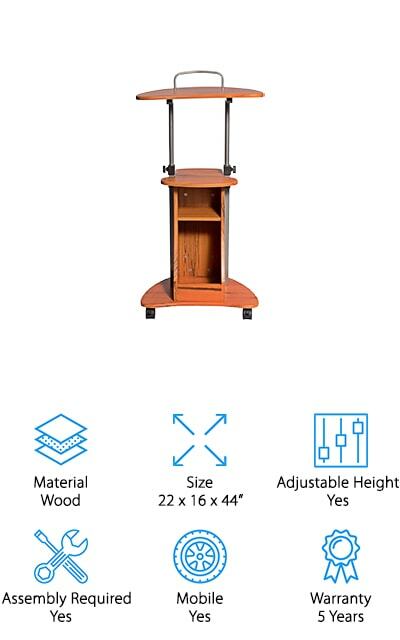 If you’re a simple desk worker, the Techni Mobili Laptop Cart is great option if you have minimal space for a standing desk. The FEZIBO Standing Desk Converter is another standing desk riser that transforms your current desk into a standing one. This metal desk gives you the option to customize your setup with a removable keyboard shelf. You can also mount your monitors to the desk itself, giving you more space to work with on the top desk area. To adjust the height, just grab a hold of the handle on the side and adjust to the height that fits you best. There’s also an electric option if you want to step your desk game up. The desk itself can hold up to 33 pounds of gear and monitors. Using this desk may reduce your risk for heart disease, back pain, and other physical problems as it gets you on your feet and out of your chair. You’ll find that you may experience better blood flow and have better posture after using it, too! The FEZIBO Standing Desk Converter turns your regular desk into a new age desk instantly. The Mount-It! Mobile Stand Up Desk does just that; it mounts your monitor front and center. Made from sturdy metal and holds up to 132 pounds in total weight! 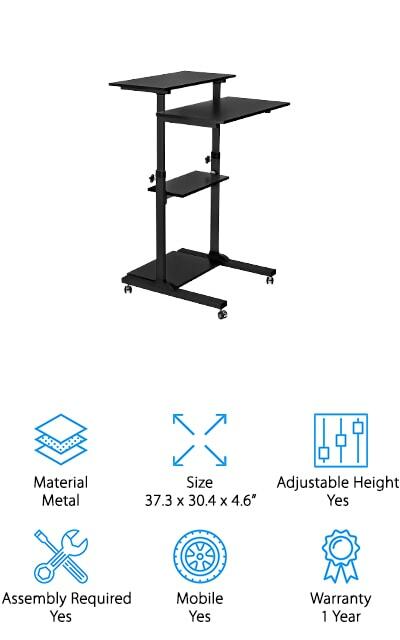 Each shelf can hold up to 33 pounds, too, so any shelf is sturdy enough for heavy duty office equipment like printers, fax machines, or monitors. With 4 shelves, you’ll have ample room to store anything and everything you need to get your work done. This desk is also completely mobile. You’ll find four wheels along the bottom to scoot it anywhere and everywhere you’d like. Once you find the perfect spot, lock down the wheels and you’ll have a solid surface to work from. Assembly is required, but you have the option to have your desk professionally assembled if you need a little extra help. The Mount-It! Mobile Stand Up Desk is a great option for public speakers, too, as it can be used as a podium for speaking events. Safco Products brings to you our last pick: a stand-up desk with four shelves for ultimate storage. 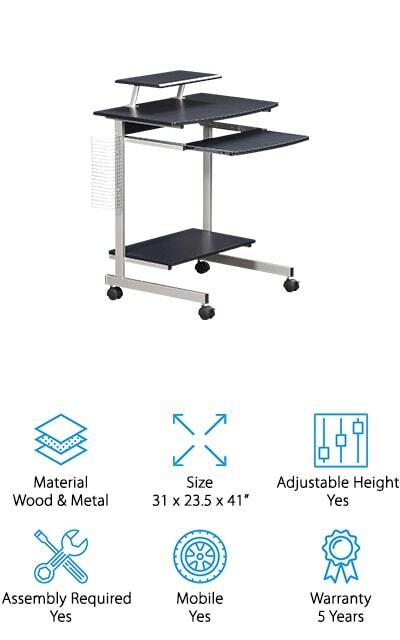 This is another one of our favorite affordable computer desks as it’s ready to move whenever and wherever you want it, but gives you all the space you need for work on the go. Made with metal structures and laminate shelves, you’ll find that this desk is sturdy and durable. If you normally have cords hanging out everywhere, the decorative sides of this desk help you hide any extra cables you normally can’t hide. You can adjust the height from 35 inches to 49 inches, so double check your measurements before purchasing. The shelves can be adjusted in 5 inch increments so you can customize your desk exactly the way you want it. Even though this is our last pick for our list of standing desks, you’ll find that Safco Products Stand-Up Desk is a great, affordable desk if you’re looking to change things up.